Britax has consistently made a name for themselves as a manufacturer that goes above and beyond in regards to safety features. 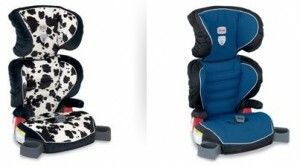 From infant seats to booster seats, their car seats have won awards and gathered the praise of numerous publications and parents alike. 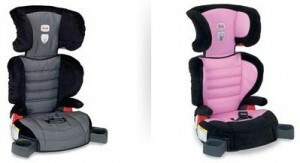 The Britax Parkway SG is a belt-positioning booster for those final years your child spends in a car seat. These forward-facing boosters are suited for kids weighing in between 40-120 lbs and come equipped with Britax’s True Side Impact Protection, Energy-Absorbing Foam Liner and SecureGuard which helps to prevent your child from sliding out under the lap belt during impact. You can also choose the Parkway SGL which includes ISOFLEX Flexible Lower LATCH Connection System to secure the booster to the car with LATCH connectors – useful for keeping the booster from flying around your car when not in use by a child. Kids will like the mostly mature color options (pink, grey, blue and cow print), armrests and retractable cup holders while you’ll appreciate the washable fabric (they might be older, but they’re still messy), space-saving narrow footprint and color-coded seat belt guides to make it easy to use correctly. The Britax Parkway SG also has a quick-adjust headrest and a detachable back which easily converts it into a backless booster without losing the cupholders or armrests or diminishing the SecureGuard feature. So far, my favorite features are the narrow footprint (with three across the backseat, any extra room is welcome), the True Impact Side Protection wings (which also give some added support for backseat snoozers) and the detachable back option. My 5-year-old , however, insists the seat’s high honors should be awarded due to its dual cup holders (his previous seat had none). And hey, if that makes him happier to sit in a booster, then let’s load ’em up with a water bottle and snack cup and hit the road. Currently 20% off at Amazon and Diapers.com. Kate Bayless is a writer, editor and mom of three boys. Visit her at www.katebayless.com or @katebayless. Britax provided a sample of this booster seat for review. This is exactly the booster we are going to buy. My biggest question is when to do this. My 4.5 year old is 40 lbs and 43 inches tall. He is really wanting to switch, as all his friends are in boosters, but he’s in the britax marathon which goes to 65lbs. When did you make the switch? What did other mothers do?